Eulachon are an important food source in many of Alaska’s rural communities. The eulachon is a small fish up to 10 inches in total length. 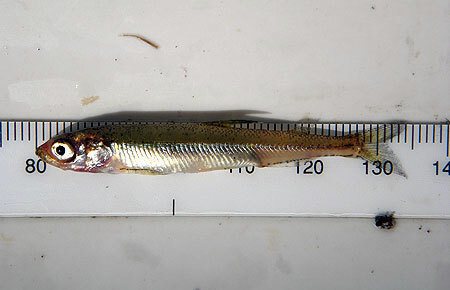 It is distinguished from other Alaska smelts by having the front of the dorsal fin begin well behind where the pelvic fin attaches to the body and by having circular grooves on the gill covers. The mouth is equipped with moderately developed canine-like teeth, which are lost as the fish approaches maturity, so by spawning time it usually has no teeth at all. Eulachon are generally blue-silver in color in salt water, turning to gray-brown and green when moving into fresh water at spawning time. Males are easily distinguished from the females by their longer paired pectoral and pelvic fins and during spawning by the tubercles on the head and scales along the lateral line, as well as ridges of musculature along the lateral line. Eulachon are anadromous which means it lives part of its life in the ocean and part of its life in fresh water. Eulachon spawn in fresh water streams. As the spawning season approaches, eulachon gather in large schools off the mouths of their spawning streams and rivers. Eulachon do not strictly "home" to a particular stream like salmon, but appear to use streams in the general area where they were spawned that have the best habitat conditions. Eulachon spawning rivers are typically slow moving waterways since eulachon are weak swimmers that cannot travel through long stretches of high water velocity. Spawning sites are in the lower elevations of the river or stream, but in some rivers with long flat deltas spawning sites may be many miles upstream. Eggs are "broadcast" over sandy gravel bottoms, once fertilized a sticky substance allows them to attach to sand particles. Their adhesive eggs, about 30,000 per female, attach to sand or pebbles. The eggs hatch in freshwater in 21 to 40 days, depending on the water temperature. After emerging from the eggs, young eulachon migrate downstream to salt water to grow to maturity in the sea. After three to six years at sea, they return as adults to spawn. After spawning, the majority of eulachon die. River currents carry newly hatched young to the sea where they feed mainly on copepod larvae and other plankton. As juveniles and adults they feed mainly on euphausiids, a small shrimp-like crustacean sometimes called krill. Since stream water temperature can affect the timing of the spawning migration, the numbers of spawning eulachon returning to a particular stream can vary greatly from year to year depending on stream water conditions and overall ocean survival. In Southeast Alaska, the main spawning migration can occur as early as April; while in Southcentral and Western Alaska, spawning generally occurs in May. Certain drainages like the Chilkat, Alsek, and Copper River, have occasional winter runs in January and February if temperature conditions are right. Some streams can have two separate but overlapping migrations. In Alaska, eulachon are seasonally abundant in several drainages from Southeast Alaska, west to the Copper River Delta and westward out to the beaches of Nome in the Bering Sea. Watersheds with eulachon migrations include the Unuk (Eulachon), Stikine, Taku, Mendenhall, Lace, and Chilkat rivers in Southeast Alaska; the Situk and Alsek near Yakutat; the Copper River Delta area near Cordova; and the Kenai, Susitna, and 20-Mile rivers in Cook Inlet. Population discreteness for eulachon within and among river systems in Alaska is unknown, as very little information exists on eulachon in general. It is clear that an understanding of eulachon genetic population structure is necessary to identify appropriate management units for maintenance of biodiversity and productivity. Overall strength of eulachon returns vary across the state by year and location. Why run strength remains strong in some areas while weak in other areas is unclear. The eulachon is a small fish up to 10 inches in total length. 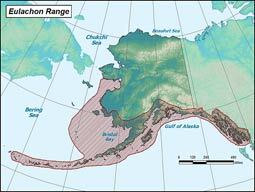 Coastal marine waters from Southeast Alaska north to the beaches of Nome. Small shrimp-like crustacean commonly referred to as "krill"
Salmon, sharks, sturgeon, sea lions, seals, humpback and beluga whales, seabirds, eagles, ravens, crows, and bears. Female eulachon can produce up to 30,000 eggs and most eulachon die after spawning.